With bye-weeks starting, streaming Alex Smith and playing Cam Newton is out of the question. Case Keenum has an A+ matchup against the Chiefs who are allowing an average of 30.1 fantasy points to the position through three weeks. If this game was at Arrowhead I may shy away a little, but this game will be played at Mile High and Keenum is a solid plug and play this week. Sony Michel owners have found the break they've been waiting for - not only is Michel getting healthier by the week, but Rex Burkhead was just placed on IR. With James White as his only main competition in the backfield, Michel should immediately take over first and second down responsibilities against the Dolphins. New England's offense will certainly bounce back after seeing a few down weeks in a must-win game. Did you see what Calvin Ridley did last week against the cornerbacks of the Saints not named Marshon Lattimore? 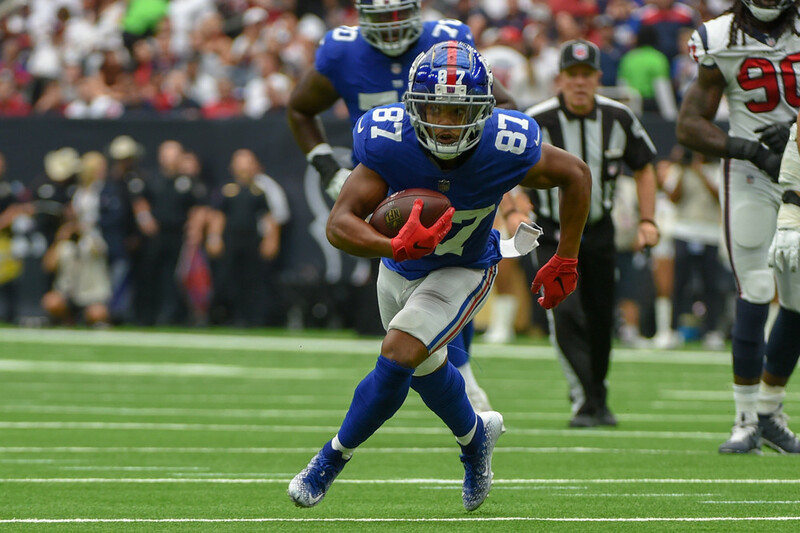 With OBJ undoubtedly being covered by Lattimore, Sterling Shepard is set up to have a monster game this week in what could turn out to be another high-scoring matchup. Shepard should be able to take advantage and outscore his production of 6-80-1 from last week's matchup against the Texans. Trey Burton has been mediocre this season but has caught 4 passes in back-to-back games and tallied a season-high (55) in yards last week. He squares off against the Buccaneers who have surrendered over 115 yards to the position over the past two weeks. Start Burton with confidence this week as he has the best matchup for a tight end this week. While the Chiefs are fairly good against allowing points to opposing team's kickers, this game should be high scoring. If the game is competitive and the Broncos are keeping up with the Chief's high powered offense, Brandon McManus will have his fair share of attempts if the offense stalls in the last third of the field. The game is being played at Mile High where McManus has had a lot of success with FG attempts from 50+ which in some leagues is worth bonus fantasy points. Can Josh Allen complete the upset on the road two weeks in a row? I don't believe he will, and it's not like the Vikings didn't get to the QB. They accumulated 3 sacks and if Clay Matthews isn't called for roughing the passer every other drive, the Packers should be able to score well over 10 points and remain one of the best streaming options of Week 4. Blake Bortles disappointed last week against the Titans throwing for under 160 yards and didn't throw a touchdown pass. This week the Jags are at home and play against the Jets who have surprised with their defense through three weeks, keeping QBs to an average of 12.1 fantasy points. This game could be another low scoring affair in which both defenses keep the opposing offenses intact. There are other better streaming options this week than playing Bortles. Through 3 weeks, Peyton Barber is averaging an uninspiring 4.7 fantasy points. This week he goes up against a Bears defense at Soldier Field which gives up the least amount of fantasy points to the running back position this season. Even with bye weeks taking away a few key RBs, I wouldn't want to be starting Barber this week in a very tough matchup. Fool me once Is this going to happen all season long? Just when you think you can trust Amari Cooper from his Week 2 performance against the Broncos, he goes and catches 2 passes for 17 yards against the Dolphins. His matchup is an okay one this week against the Browns, however he simply cannot be trusted in the offense at this point. For me, I need a more consistent amount of targets and another one or two prove it games from Cooper. With Jimmy G gone for the remainder of the season, George Kittle's value undoubtedly takes a massive hit. Yes, we know Kittle played college ball with C.J. Beathard, but it's not the same as the connection with Garoppolo and facing the Chargers doesn't make things any easier - the Chargers are allowing the third-fewest amount of fantasy points to the position (5.9). The only thing keeping this Chicago Bears team afloat is their one-man wrecking crew on defense, Khalil Mack. The offense has serious troubles moving the ball consistently down the field and with a tough running matchup against a stout D line in Tampa Bay, these struggles should continue. The Bucs haven't allowed a kicker to hit 7 fantasy points at the position and yes, this may be due to their awful pass D, but if the Buccaneers jump to an early lead, Trubisky will be throwing and Cody Parkey and the Bears be unable to just settle for field goals. With there being no end in sight for the Rams' stellar offense, the Minnesota Vikings defense, on a short week, should not be started. The Rams have legit options through the air in Cooks, Woods, and Kupp, and obviously have Gurley running the ball. They're one of the most complete and balanced offenses in the NFL and don't rely on one single piece. With the Vikes D just getting smoked by the Bills last week, I wouldn't hold much faith in starting their defense, especially on the road.